Kame no Yu is one of Togura-Kamiyamada’s 7 day-use bath houses. It is the main bath house for Kamiyamada, and many locals come here for here for a soak every day. It is not uncommon for people to not have a shower or bathtub in their own home so coming to Kame no Yu is a daily ritual. You’ll find a steady stream of locals coming for their daily bath. Kame no Yu is actually run by the Kamiyamada Onsen Company, and they are very liberal with the amount of onsen water they provide for the baths here, making Kame no Yu one of the best bath houses to experience Kamiyamada’s hot spring mineral water. 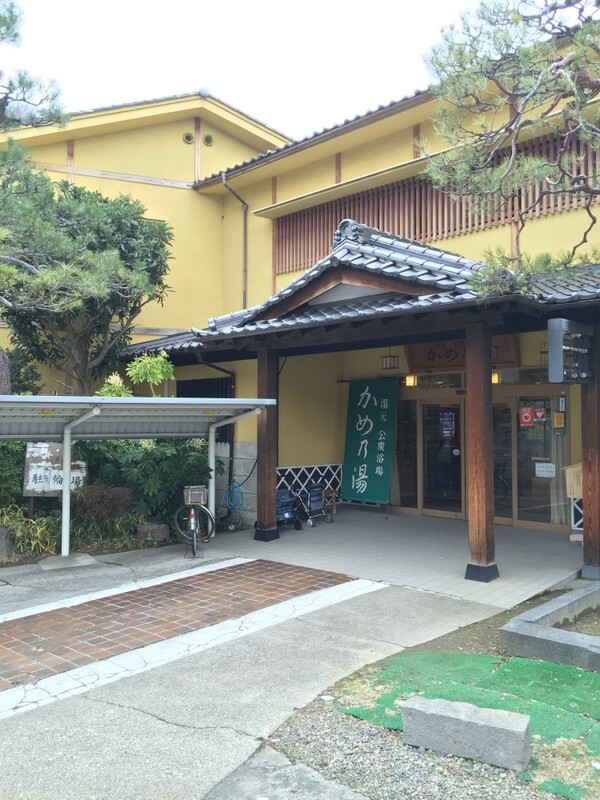 As you came to this bath house, you may have noticed a massive abandoned hotel at the base of Joyama Mountain. This ghost hotel is a relic of Togura-Kamiyamada’s hey days in the 1970s and 80s. Back then, there were busloads and busloads of groups, mostly men, mostly neighborhood groups or company workers, mostly coming to Nagano City to make a pilgrimage to Zenkoji Temple. That was the ‘status’ place to go. After taking an official group photo and buying the obligatory souvenirs, they would stay at a ryokan here, throw a huge banquet, call in the geisha, and live it up for a night before returning to their regular lives. Japan’s travel culture has since evolved. It’s now people going to places they want to go, with the people they want to be with to do things they want to do – much more individualized. That ghost hotel didn’t make the transition. Today, there are 30 inns and hotels in town that cater to individual travelers from all over Japan, and hopefully, from all over the world.